﻿ 10 Proven eCommerce Marketing Strategies to Grow your Online Business » Red Mango Marketing! The online retail industry is booming, and with the right ecommerce marketing strategy, you can be on the bandwagon to success too. Ecommerce sales are expected to increase to $4.479 trillion by the end of 2021. What separates the businesses who are successful in the ecommerce industry from those who struggle and give up? A strong, well designed, and effective ecommerce marketing strategy is the thin line between the success and downfall of ecommerce businesses. Whether you’re a new business or one that enjoys a good customer base, it is important to keep up with the changing trends in marketing and continually tweak your strategy to match. The ecommerce industry is not just large and highly competitive, but also continually changing. Those who stay on board with the dynamic trends make it to the top. Running an ecommerce business is different from running a physical store or any other kind of online platform. Your main priority is increasing your sales and revenue, but not at the cost of affecting your brand identity or reputation. Creating a marketing strategy for ecommerce is therefore not just about how to get more sales but also making the customer experience better, building brand awareness, and building a lasting relationship with your customers. Getting started with email marketing? Try Constant Contact’s 60 Days Free Trial and create powerful emails. Why do I insist on “building” an ecommerce marketing strategy and not just “making” one? Because it needs to be a step-by-step process, and not just putting everything down. You may be excited or even compelled to do it all at once, but that creates a mess. So, let’s get started and build our ecommerce marketing strategy, step-by-step. As an ecommerce business, your website is your address, the place where customers can fill digital shopping carts with your products and have an experience that compels them to keep coming back. An optimized website includes an intuitive layout, easy-to-read language, simple navigation, and a variety of design elements that lead to a clear call-to-action. Keep it easy on the eyes and even easier for consumers to find the product or information they need. Create landing pages when necessary, keep product pages clutter-free, and include a contact page where customers can find all of your important information. Search Engine Optimization (SEO), is an absolute must if you want to be competitive. Simply put, SEO is the practice of polishing up your site, through the right keywords, headlines, and content, to help people find the products you offer, as high on the search engine results page as possible. Fill your site with quality, relevant content to creates a great user experience and rank higher for SEO. As an ecommerce business, you have to cater to all kinds of customers. With most customers relying on their mobile devices for almost everything, creating a mobile-friendly ecommerce experience is essential. People are shopping on the go. Optimizing your ecommerce website for mobile increases your chances of converting your target audiences into paying customers. Design the best experience you can offer your customers, to help them buy easily through your ecommerce store, no matter what device they use. You can further use mobile marketing techniques like geo-targeting to reach mobile users in specific geographic locations. The content you use to fill your website should be original. You may look at other ecommerce websites for inspiration, but then use your own content marketing strategy to create high quality, original content that is relevant, informative, crisp, and creative. The content you create, text, video, infographics, or something else, must align with your brand priorities and brand image. For example, if you’re a business that targets a young audience, keep the content light, fun, and relevant to that specific audience. Content marketing turns content into a tool for attracting customers and selling your products. It is a story your business is trying to sell. When done right, content marketing attracts attention, creates interest and starts conversations. You’re not just creating content, but making sure it’s reaching the right people at the right time. It also creates sustainable communication between a business and its audiences. The content you create could be of various types like blog posts, videos, newsletters, infographics, and more. Follow the 80/20 rule: 80% of the content you produce should focus on being informative, while the other 20% content is focused on promoting your ecommerce website. And don’t underestimate the power of user generated content from loyal customers. You can utilize this unique content through social media platforms, on your blog, and more (with their permission of course)! Email marketing is one of the most effective ways to reach out and stay in touch with your customers. Relevant email campaigns, sent to people who agreed to receive them, can add a personal touch to your communications and interactions with customers. With email marketing for ecommerce, you can send out invites to an event, links to new blogs or guidebooks, promotion codes, reminders for subscription renewals, reminders for abandoned carts, and so much more. With tools like automation, this process becomes even easier and quicker. More tools, like click segmentation, let you send the right message to the right people. There’s a reason email marketing has been used and loved by marketers around the world. Social media has changed the way we do business today. Social media marketing allows you to connect with your audience on a one-to-one basis and makes your communication with them more intimate. You can boost traffic to your website, engage with the audience, generate leads, and reach out to a large, dynamic customer base. Social media platforms allow you to create consistency and build a brand that becomes recognizable over time. Know the latest social media trends and include them in your marketing initiatives. Pay per click (PPC), is a three-fold campaign that combines ads, promotions, and landing pages. The ad must contain an enticing offer that leads a person to the specific landing page for further information. For example, if you create an RSVP ad for the event you’re hosting, the ad must explain the benefits of the event, and the link should lead the person to a landing page that allows them to register for the event, plus further event details. If you want people to choose your ecommerce business over others, you need to be present everywhere. Customers love when a business puts forth the effort to understand individual needs, and the ability to buy products through multiple platforms. This also boosts the traffic to your website, makes it rank higher for SEO. You made a great ecommerce marketing strategy, you got the audience to your website, and they browsed through your products, but they didn’t buy anything. No problem – retarget them, and this time make sure they don’t leave empty-handed. An ecommerce marketing strategy is slightly different than a strategy for other websites not selling products. Your main focus needs to be on building a great shopping experience – from the moment a potential customer lands on your website to the checkout page. It’s cliched but true, and ecommerce marketing strategies are always evolving. The only way to be successful is to keep experimenting with your strategies to compete with other businesses and find more customers. No matter how great your ecommerce marketing strategy is right now, everything becomes ineffective someday. If you’re willing to change it with the times, you can overcome the competition around you. The right ecommerce marketing strategies drive sales, conversions, interactions, and engagement. They drive success. 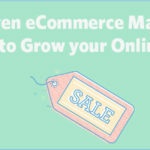 The post 10 Proven eCommerce Marketing Strategies to Grow your Online Business appeared first on Constant Contact Blogs. This entry was posted on Thursday, February 7th, 2019 at 4:02 pm	and is filed under News & Updates, Online Marketing, retail. You can follow any responses to this entry through the RSS 2.0 feed. Both comments and pings are currently closed.